Gail’s fist visit of 2016 was marred by a very bad bout of flu, which meant she had to delay her flights, so spent less time in Ladakh than she had planned. Gail and Rinchen Dolkar visited Shey Lamdon school to organize the start of the building work on the hostels. They also took a video of hostel life at the school which will be edited professionally by Brook McAllister once back in UK and posted on this website. Gail conducted an official handover of the first cheque for the school from Liam Ackerman who will be cycling from Manali to Leh to deliver the highest Amazon kindle to Shey Lamdon. Liam works for Amazon Logistics – see here for details. All the staff and the director of the school society were present. The level of education at this school is very good, and the children seem very happy. It is well run with an emphasis on their culture. 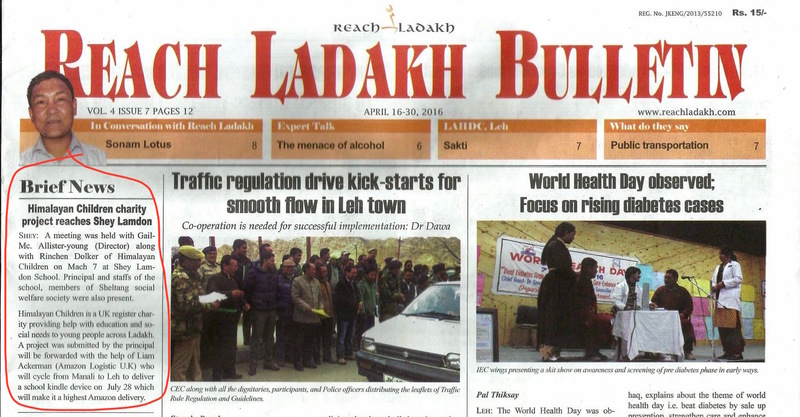 Gail wrote a press release for the work at Shey Lamdon and Liam Ackerman’s ride form Manali to Leh. This was also broadcast on the local radio, and on the local tv news, which she unfortunately didn’t see as the electricity was cut! Gail also had visits from some parents with their school receipts from her visit in March, including lovely lunches cooked by some supported families too. She did not visit all the children on this trip as did not have much time and they were in school. She also met with a couple of new families, all of whom were very worthy. Life in Ladakh is difficult if your husband or wife dies and you are left to support your family. Also, as seen at first hand, if your husband falls very ill and doesn’t regain good health at a young age, life can change radically here for the family. 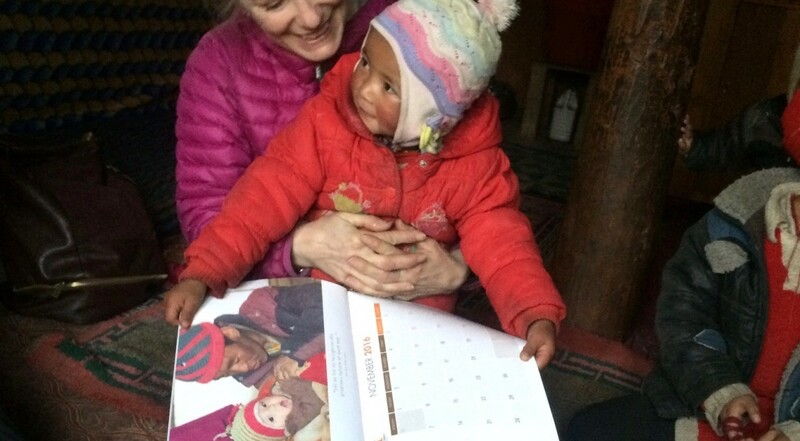 The money raised from Gail’s Nomadic Calendar was used to buy a tent, school books, pens and pencils for the Nomadic nursery run by the Nomadic family that she lived with last year. The tent will be used for the little children on the camp travelling with them, to enable them to have a small area enclosed just for learning and play.